Join Adventure Women in September 2015 for canoeing and "glamping" (glamorous camping) on the Missouri River in Montana as we travel the route of the historic Lewis and Clark Expedition, following the path of these intrepid explorers as they searched for the headwaters of the "Mighty Missouri". As we canoe down the Missouri River, many Lewis and Clark Trail sites offer views that are nearly unchanged from the early 1800s. For five days we'll paddle through the famous dazzling white sandstone of the White Cliffs, and the rugged badlands of the Missouri River Breaks—natural landscapes of historic fame—and imagine what it felt like to be part of that first expedition. To help bring the river's history alive, we'll paddle 34-foot canoes that replicate those of the early voyageurs, and are similar in size to the dugouts used by Lewis and Clark's Corps of Discovery. Each canoe will carry up to 14 paddlers and two guides, making the perfect platform for spinning yarns and pointing out the many details of interest along the way. This is "glamping" (glamorous camping) at its finest! Every afternoon, a "camp boat" will run ahead of the group, arriving early to our private camps, setting up the kitchen and spacious 2-person tents, which have cots, sleeping bags, flannel liners, and thick foam self-inflating sleeping pads! Arrive in camp and all you have to do is carry your personal gear to your tent, freshen up, and then head to the kitchen for hors d' oeuvres and dinner. If rivers could talk, the Missouri River would tell a story few other rivers could match. Along her banks are the threads of every major theme of past centuries on the Western Plains: the Indian cultures, white man's exploration, the fur trade, the steamboat era, the collision of white expansion with the last Indian strongholds, the resultant military occupation, and finally, the establishment of permanent white settlements, the range-cattle industry, and farming. Each stroke of our paddle and every footstep on shore resonates with the wonder of Lewis and Clark's epic journey on the Missouri River through Montana, and the history of the westward movement. Our adventure begins when we meet in Great Falls, Montana, at the Holiday Inn by 5 p.m. We’ll do a quick check of who has arrived, and suggest places for dinner. When Meriwether Lewis’s advance party reached a waterfall on the Missouri on June 13, 1805, he was relieved to identify the Missouri’s course. But as he surveyed the falls for a portage route, he walked upstream and heard another falls! And then another, and another. The “Great Falls” was actually a series of five, which required nearly a month-long portage for the Corps of Discovery. So meeting in Great Falls is an appropriate starting point! Tonight at 7:30 p.m. we gather together for the first time for an orientation meeting, with drybags handed out so that we can pack our gear. At 7:30 this morning we depart our hotel and drive an hour to the charming and historic town of Fort Benton, located on the banks of the Missouri River. Continuing from Fort Benton we drive another hour to our put-in at Coal Banks Landing. Here the staff prepares us with a thorough safety orientation, while our personal gear is loaded onto the cargo raft. We board our canoes, launch on the river, and enjoy paddling a few miles before stopping for a delicious riverside lunch. We travel between 8 and 11 miles the first day and arrive at camp around 4:30 p.m. Our camp boat has traveled ahead and set up a luxury camp including all tents. We arrive in time to enjoy free time for swimming, hiking, reading or just relaxing before hors d’oeuvres are served, then dinner. The day ends with stories and songs around a crackling campfire. We are awakened around 7 a.m. with the smell of fresh brewed coffee. After a hearty breakfast, we pack up our personal gear, the canoes and cargo raft are loaded, and we depart from camp about 9:30 for an adventure packed day. The river carries us from its wide, meandering valley into the famous White Cliffs area—a deep, rugged gorge where the Missouri has cut through the sedimentary floor of an ancient inland sea. Steep, eroded cliffs reach a depth of nearly a thousand feet and reveal 10 million years of geologic history. Wind and water have eroded the sediments, creating massive rock crags and magical castles of dazzling white sandstone that loom above the river. The journals of Lewis & Clark are filled with superlatives describing these wonders. As we continue downstream, our itinerary allows plenty of time ashore to explore. We hike the Eagle Creek area and Neat Coulee for several hours. It’s here that Lewis & Clark camped on May 31, 1805, viewing the alcoves, amphitheaters and sandstone cathedrals of the White Cliffs. Further on and after lunch, we gaze upon Citadel Rock, a massive igneous intrusion, immortalized by German Prince Maximilian’s artist Karl Bodmer in 1833. A few more miles to Hole-in-the-Wall, and we make camp. We hike to the Hole-in-the-Wall (the top of the sandstone formation from which the name comes) and surrounding coulees where Butch Cassidy, the Sundance Kid and other gang members hid with Kid Curry in the late 1890s. In order to provide you with the richest experience possible, our guides divide themselves into “meal crews,” which means that while two guides are preparing dinner, the other two or three guides are free to spend time with the group-to hike, help identify flowers or trees, give a lesson in Dutch oven cooking, or just sit and visit. One of the reasons that the Missouri is such a fabulous trip is the incredible variety of things to do and see along the way. We stop often, taking advantage of as many of these opportunities and explorations as possible. Floating down the river, our guides tell us about the early pioneers who lived there, and we stop to hike to one of their old homestead cabins. We talk about the Indians and walk to one of their encampments. Our trip is planned so there’s plenty of time for these activities. As we explore the Missouri River and its environs, we see evidence of the Indians who lived there, the Blackfeet and Gros Ventre. We see their teepee rings—circles of stones that were used to hold down buffalo hide tepee covers—from over a century ago, and talk about the other tribes—the Salish, Nez Perce and Shoshone—who came from the Rockies to hunt buffalo. We learn the story of Chief Joseph’s band of the Nez Perce, who crossed the Missouri in September of 1877, near the end of their tragic 1200-mile flight for freedom. As we paddle down the river, the impressive landmarks of Steamboat Rock and Dark Butte loom on the horizon. We pass the May 30, 1805 camp of Lewis and Clark. They stopped here after a miserable, rainy day on which they only made 5.4 miles. We stop at one or two pioneer homesteads and imagine life 100 years ago. As the Indians were moved to reservations, white settlers began to homestead the land. They struggled in a harsh, lonely environment. Today, almost all these homesteads have been abandoned, but as one walks through the empty corrals, tool sheds and cabins, it seems as if these pioneering souls left only yesterday. Above us soar golden eagles, hawks and falcons. Feeding from the river we see osprey and herons. Cottonwood, juniper and pine grow along with sagebrush, cactus and wildflowers, providing food and shelter for beaver, antelope, deer, elk and bighorn sheep. In late afternoon we pass Slaughter River, where Lewis and Clark camped on both their upstream and downstream journeys. It’s a satisfying day of history, paddling and nature. Tonight’s camp is within walking distance of a prairie dog town and with binoculars and a spotting scope we can observe their antics and social behavior. Enjoy another night of camaraderie and sharing. As we float today we hear the remarkable Indian legend about the Arrow Creek for a great Indian story. The river widens and we float through the Judith Basin, where the first military post, Camp Cook, existed from 1866-1870. The Judith Basin was placed on the National Register of Historic Places in 1975 because of its rich history. We are now entering the badlands of the “Missouri River Breaks” and a different geology than the White Cliffs area. These wildlands are largely unchanged since the Corps of Discovery passed through. Tonight’s camp features a superb mud bath, excellent hiking opportunities and is our last night on the river. This morning we may hike downstream for about a mile, or float in our canoes, to the old Hagadone Homestead and hear all about its history. We’ll explore old horse-drawn farm implements, the original homestead cabin, and pioneer life. We paddle farther and stop for lunch along the river before reaching our take-out at the Stafford/McClelland Ferry Crossing, arriving at about 2 p.m.
We return by late afternoon to Great Falls and the Holiday Inn. After a “real” shower, and change of clothes, at 7 p.m. we head out to a local restaurant with our guides to celebrate the week together at our Farewell Dinner. If you drove to Great Falls, your car is patiently waiting for you. If you flew, take the complimentary hotel shuttle just 10 minutes to the Great Falls airport. 7 days/6 nights double occupancy hotel and tent accommodations. Two nights hotel accommodations in Great Falls at the Holiday Inn, Great Falls, (first and last nights) in twin-bedded double occupancy rooms. 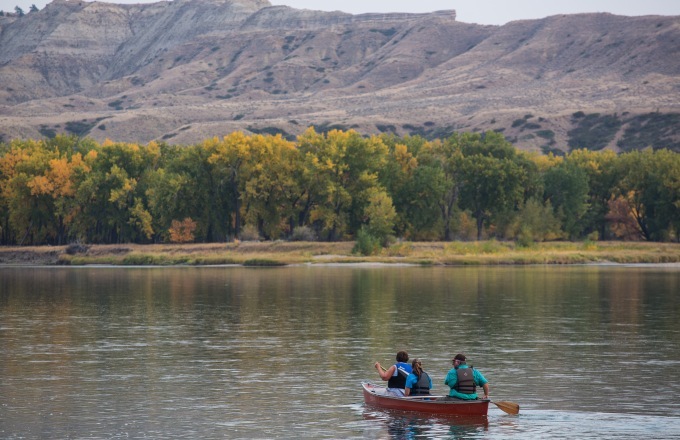 Five-day fully guided canoe trip on the Missouri River: 2 guides per canoe; a Lewis and Clark historian/interpreter; camp boat with staff to travel ahead and set up camp and kitchen; and one AdventureWomen Associate. 34-foot replica canoes, each holding 14 paddlers. Transportation to and from the river from Great Falls, and all museum entrance fees. Full course meals from lunch the first day of canoeing through lunch the last day, plus farewell dinner the last night in Great Falls. All river equipment including: canoes and accessories; Coast Guard-approved life jackets; waterproof bags for personal gear; waterproof boxes for cameras; tents and ground cloths (2 persons per tent); cots, sleeping bags, flannel liners, and thick foam self-inflating sleeping pads. For those with prior canoeing experience, the option of smaller, 17-foot Mad River canoes. Round-trip airfare to Great Falls, Montana. Small camp pillow (or a pillowcase into which you can stuff clothes). A suggested gratuity to your guides/crew/and interpreter (a total of approximately $125 - $150). received in writing. Full payment is due 90 days prior to departure date, and 50% of the registration deposit is non-refundable. For cancellations received 60-89 days prior to the trip departure date: 50% of the total trip cost is non-refundable. For cancellations received 1-59 days prior to the trip departure date: 100% of the total trip cost is non-refundable. You are highly encouraged to purchase trip cancellation insurance to cover emergency situations. Information will be sent to you in your registration packet.